Mobile technology is transforming warehouse operations to support the new era of customer-defined supply chains. Consumer expectations are leading more retailers to adopt an omnichannel approach in which the customer experience across all touch points provides a uniform and pleasing experience. To support this revolutionary change in supply chain management, retailers are revising their operations to embrace the digital warehouse, using technology such as wearables to boost efficiency and improve workplace safety and productivity. While mobile technology is invading the retail space, it’s also becoming more prevalent behind the scenes in warehouse operations. Technology solutions such as smartphones, tablets and wearables help drive warehouse and distribution center productivity through enhanced communication and management tools. Much like consumers use their wearables to monitor fitness levels, supply chain workers and managers use them to measure and monitor the health of their warehouse operations. Managers can receive updates and alerts on events in the operation and can geolocate employees to improve production efficiency. Warehouse control systems can be programmed into a smartwatch to boost productivity and support data capture and analytics, and managers can also keep an eye on key performance indicators, right from their wrists, for better-informed decision-making. 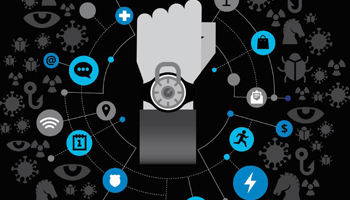 Additionally, unlocked smartphones can integrate with wearables to provide real-time updates to employees. High-volume supply chain operations can optimize processes, improve workforce productivity, safety and efficiency while providing hands-free or one-hand operation. Mobile and wearable devices help reduce the touch points, or the number of steps required to complete a task. Location-aware apps will be able to identify where an employee is, and offer contextual data, such as the product location, before the user asks for it, reducing searching time. With information at their fingertips, employees can work smarter, not harder. Wearable devices can also boost productivity with repetitive processes such as picking, put away and general order fulfillment accounts, which account for nearly 70 percent of operating costs, according to Datex. Using technology to reduce errors in routine tasks can pay off quickly. The adoption of techniques such as voice picking is an indication of the value of hands-free communication, freeing employees from time-consuming references to paper or screen-based information. Technology also enables the adoption of a digital warehouse strategy, linking organizational silos to fully integrate the supply chain from raw materials to consumers. Mobile devices are the gateway for data collection and analysis that gives companies insight into their supply chain situation to support their omnichannel strategy. Replacing paper systems or legacy-based processes can help reduce data entry and processing errors and enable the adoption of the digital supply chain integration. In the rush to quick start e-commerce capabilities, companies should avoid simply bolting on new systems and processes to existing supply chains. Transitioning to a supply chain strategy that fully services both e-commerce and traditional store fulfillment requires a fully integrated technology strategy. The IT infrastructure must enable cross-channel visibility across functional boundaries, linking sight between product development, demand planning, logistics and marketing. With a blended integration, organizations should take the time to evaluate what needs can be served by wearables and hands-free technology so that it’s completely beneficial — and functional — when it’s implemented. For an omnichannel strategy, cross-functional collaboration is vital. Existing supply chain capabilities are still relevant but must be blended with the new augmented capabilities, so companies should create teams that mix staff with digitally disruptive capabilities and those who are more aligned with the existing model, notes EY. As we move forward, mobile devices in the digital warehouse will increasingly connect suppliers, retailers and customers into a single value chain that’s becoming more efficient and responsive in this era of connected, consumer-driven retail. Download your guide to mobile solutions that help increase fleet efficiency, compliance and retention.